Editor’s Note: Since this post, I have found what I believe to be the best buttermilk biscuit and wrote about it here. It’s a triumphant moment when you can bake a good biscuit. Scratch that. 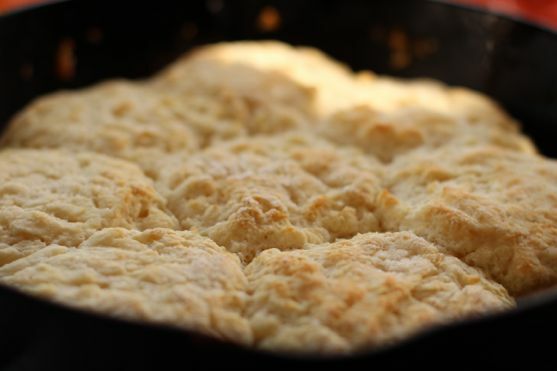 It’s a triumphant moment, when you can bake a great biscuit that is fluffy and a little more than nostalgic, conjuring up childhood memories for your husband as he wishes he had just one more morning with Meemaw and her wood burning stove. She made a batch of biscuits every morning of her life. 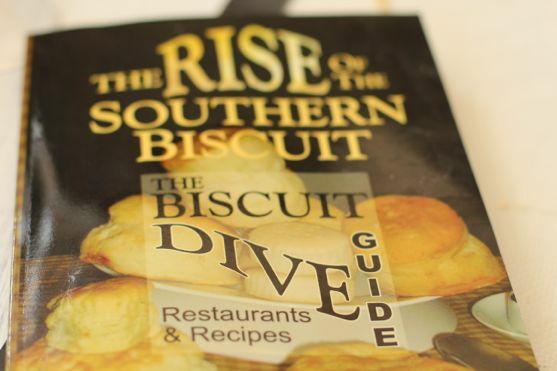 I’m not from the South, and I never had Meemaw’s biscuits, so I got a little help from Maryann Byrd’s book, The Rise of the Southern Biscuit The Biscuit Dive Guide (See all Cooking, Food & Wine Books) . 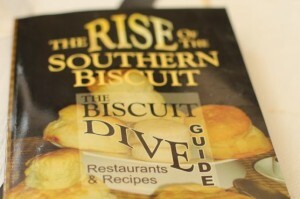 In the book, that serves as a companion to the PBS documentary, The Rise of the Southern Biscuit, Maryann chronicles several southern restaurants, cafes, diners, and dives that still make their own biscuits. She and I both live in Tennessee, and Ms. Byrd features several biscuit recipes served a mere few miles from me. When I opened the book, I was gleefully surprised to see this particular recipe, because a year ago I shared the good news about Aretha Frankenstein’s Pancake Mix. Aretha Frankenstein is a restaurant in Chattanooga that can brag about long weekend lines funky monster decor, and possibly the best pancakes and biscuits in the South, although there is lot of competition. The pancakes are so good that they have packaged a mix and I was lucky enough to be sent a case that I shared with a few other food bloggers. We all agreed to their superior texture and flavor. Their biscuit is such a big deal (literally and figuratively) that it was featured on the food network. Part of the fame of their biscuit is it’s size and part of the secret is using sugar as an ingredient. 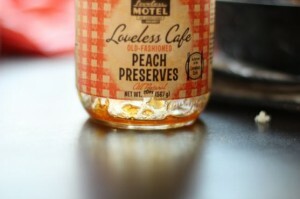 I served these with peach preserves from the Loveless Cafe, and you can see, we were at the bottom of the jar. The ingredients are simply peaches and sugar, and are fermented in such a way as to almost taste like a liquor. I’ve used this peach preserve to make appetizers with goat cheese, salad dressing and savory meat dishes. It’s not just for biscuits, but it does a biscuit good. The Loveless Cafe, is, of course, nationally famous for its biscuits and while they are featured in the cookbook, the biscuit recipe is not. You won’t be disappointed I have several biscuit recipes to test drive, I’ve made the biscuits four times now using this recipe and liking it so much, I’m hesitant to move to the next one. This is an all butter recipe that initially didn’t work for me because of its low baking temperature of 300 degrees. This is one of few recipes that calls for sugar and this explains the low baking temperature because sugar can cause the biscuits to brown too quickly. I changed the temperature to 350, used a cast iron pan, made sure the biscuits were touching (they rise better this way) and made them smaller in size. They are served in the restaurant nearly saucer size, and that is a bit too big for me. If I’ve learned anything in the process, every biscuit batch will be different and every person will create their own unique touch and taste, even if using the same ingredients. The bigger thing I learned is that a batch of hot biscuits out of oven makes people really happy. 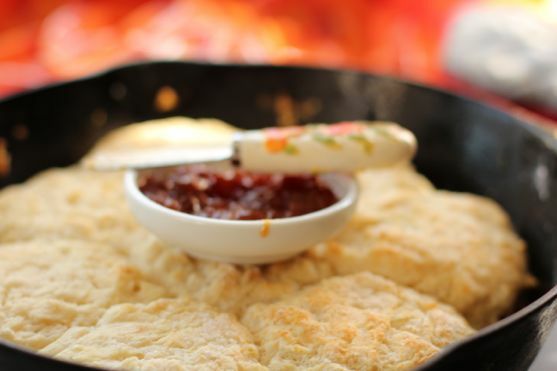 You don’t have to be born in the South to make a great biscuit, but you do need to get that Southern something in the kitchen that Meemaw had that has kept her memory alive. I aim to make other recipes from the book and share the results. 1. 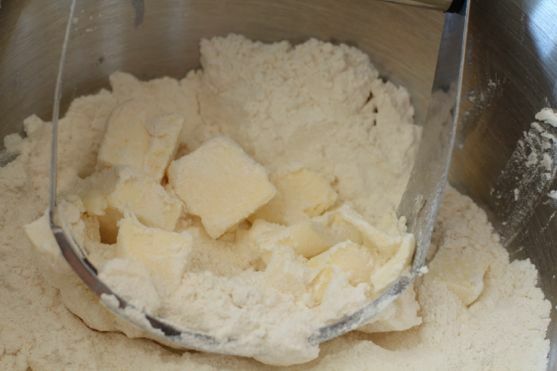 Use a good tool to cut the butter into the flour. Do not use a food processor. 2. Freeze the butter and flour. 3. Make sure butter milk is cold. 4. Don’t go overboard on baking powder. 5. Flour your hands, allow the sticky dough to stay sticky. Cut biscuit quickly and do not turn cutter. Use a straight up and down method. 6. Bake biscuits touching. This helps them rise. Legendary giant bisquits, from the famous eatery in Chattanooga. Aretha Frankenstein's Buttermilk Biscuits from Maryann Byrd's Rise of the Southern Biscuit. Mix dry ingredients together. Cut in butter to pea size pieces. Add in buttermilk, and continue with biscuit cutter until all flour is incorporated. Dough will be wet and sticky. Place on floured board, and fold making sure dough is thoroughly mixed but do this gently. Form a circle about 1 inch high and pat down with hand. Use a pint glass to cut biscuits. I used a 2½ inch glass. Place in cast iron pan or baking sheet. Sprinkle with a little sugar. Biscuits should be touching. Bake for 20 minutes until golden brown underneath. I agree with Barbra and Carol, I will try it with less liquid. So still, what is the correct amount of buttermilk? Are all the other ingrediants correct, and are the other above ingrediants, for the six cups of flour amount. The recipe above states 1 1/2 cup of buttermilk, and I know thats way too much liquid for 3 cups of flour. A sticky sticky mess that will never make it to the pan. My husband and I LOVE this recipe and are so glad to have found it! We visited Aretha Frankensteins in Chattanooga several years ago and were excited to come across the recipe as it’s the closest we have found to the TN original. We have made it at least once a month for the past few years, our biscuits come out perfect and are a family favorite! We make the recipe ‘as is’ with no issues. It is not too sticky, not too wet, it’s just right as is. Give it a shot with some white gravy, sooo good! Thank you so much for sharing this with us. Oh nice. I’m glad you like it. “I’m going to try these, etc.” or how attractive the recipe looked, etc. Do you have any comments from people after they have used this recipe? Thanks. This recipe was terrible. The dough was way too wet and it was impossible to form them the way the directions tell you to. The baking time was way off and definitely needed at least 10 minutes of baking time. As my biscuits baked, they literally formed into one big clump because the dough was way too wet to start with. I consider myself a relatively experienced baker, and these definitely do not cut it for me. There is no way to get a good dough with the amount of buttermilk the recipe tells you to add to that amount of dry ingredients. Barbara, my apologies. You were right. I went back to the book and to my notes and I had adapted the recipe, but put the wrong amount of buttermilk. I can’t thank you enough for letting me know. I have since put the original recipe here, cutting it in half for the in book, the recipe starts with six cups of flour and that is too much for the home cook. For a savory biscuit add a 1/2 c grated Parmesan or Romano to the dry ingredients. Yum! Great with soups on a chily night. To reheat any leftovers, wrap in foil and bake for about 15 minutes in a 350 degree oven. I need some help with my biscuits, and this recipe may be just the ticket. But can you use yogurt thinned with milk instead of buttermilk? Here in Mexico, cultured buttermilk does not exist. This substitution works great in the buttermilk pancake recipe in New Joy of Cooking, so perhaps it would be fine here, also. I say give it a try. You can also use milk with a teaspoon of white vinegar to make a faux buttermilk. But I can see the yogurt giving it that umph. Just keep the dough wet and you should be fine. These look so delicious! I always get confused, as we refer to these as “scones” in South Africa… biscuits refer to cookies here. Biscuits, scones, or whatever else, these look seriously yummy! Even though I’m not a big bread eater, I’m a sucker for a good biscuit. These look great! That’s what I was going for…that throwback to someone’s childhood. Baking the biscuits next to each other is a great tip Angela! That’s one that we never would’ve thought about, but you’re so right. We all want biscuits today! If I could deliver you a plateful, I would. Great post, learned a lot about a food we don’t eat normally here…just once in a blue moon. I have tried them with moderate success. Lots of great tips. I do have a recipe I like for Matcha scones which are close to a biscuit. Good Golly all mighty! I just loved this. Posted it to my wall and can’t wait to see more of these biscuit recipes… so luv this! Thanks for the link everyone loved it! Penelope, My husband is thrilled that I’m mastering biscuits. Thanks for your encouragement. The last time I made biscuits they could more accurately be described as hockey pucks … next time I will review this post before baking! Trix, as long as you keep the dough very wet and not fuss too much, your biscuit life should change. Congratulations on the move to wordpress Angela! It took a while but glad you took the step! And now that you have a SLR you’re photos are gonna be even more beautiful I’m sure! These biscuits sure look tasty! I’m so glad you posted this. I wanted to post it to my wall but can’t figure out how to do it. Let me know when you have time. Girl I love me a good biscuit and I will follow your recipe to the letter and I will even try to make my own jam….The title made me crack up. The Loveless Cafe did post a preserves recipe in the book, and that will soon be my next adventure. Biscuits and jams, the South knows how to make. Who could pass those up? Especially with that peach jam? No way. I didn’t know so much went into biscuit making. That was the first thing I learned how to make in home ec and I don’t have to tell you they didn’t tell me any of these tips that you mentioned! Love the pic of the biscuits in the cast iron! OMG! You posted it… didn’t think you got my message. OMG! Thank you so much for this… It’s what I was looking for! I do enjoy a good biscuit and the South has perfected them. I may even someday give biscuits and gravy a try.